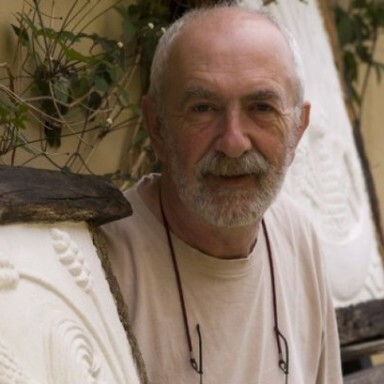 As of 2018 Joe has retired from Pargeting and is now concentrating on sculpture. Joe Pattison has been sculpting and modelling ever since he could pick up a lump of plasticine. He has worked in clay, wax, plaster, and almost all other materials, producing everything from Discworld figurines to character fridge magnets, and from scented plaster room fresheners to comical face mugs and village signs. These days he concentrates on pargeting. Pargeting is the art of decorative lime plasterwork on the outside walls and the insides of houses. It probably started to appear with the Romans but became widespread in England during the reign of Henry VIII. It stayed popular for a couple of centuries or more with another peak in the Jacobean era before beginning to decline. It is now mainly, but not exclusively, confined to East Anglia where a handful of craftsmen and women still practise this art. In the last few years there has been another upsurge in the popularity of this old craft. As well as applying the decoration directly to the wall in the traditional way, Joe also produces bespoke pargeted panels using traditional materials and techniques, framed in new or reclaimed oak. His inspiration ranges from Medieval woodwork through Jacobean design to the works of William Morris and the Arts and Crafts movement. Examples of Joe's work can be seen on his website.